A proportionate face is definitely a beautiful face. Many times, we feel that our nose in somehow not in proportion to our face. We feel that it is too large, too small, uneven or even misaligned which diminishes our attraction factor. The best way to get the perfect nose is to get a rhinoplasty (Nose) surgery at Cocoona. We offer the best and most efficient Nose surgery that is definitely going to make you look and feel new and attractive. 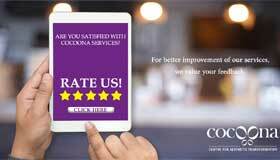 We take extra care to ensure that the end-result of the rhinoplasty surgery is according to your realistic expectations and you are discharged from Cocoona happy and satisfied. Rhinoplasty (Nose Surgery) is basically a cosmetic surgery aimed at improving the shape and size of the nose. It is done to make the nose larger or smaller as well as change the angle of the nose in relation to the upper lip or to correct abnormalities in the nose, such as bumps and indentations. 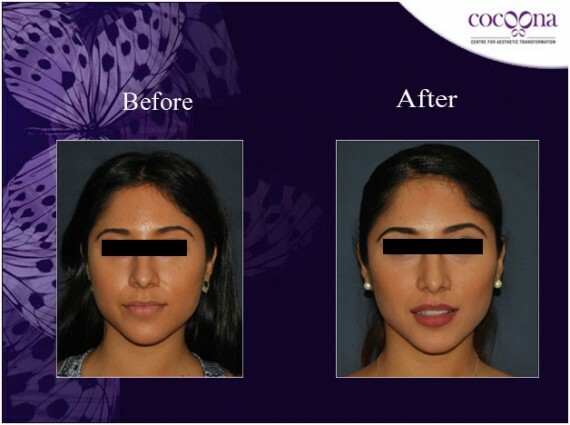 Cocoona has the most experienced and extensively trained cosmetic surgeons who are well adept at performing highly-successful rhinoplasty procedures. These surgeons have helped thousands of people just like you get the desired nose shape to become more attractive and boost their confidence. The Nose Reshaping surgery may require either general or local anesthesia and is performed as an outpatient procedure at Cocoona. The cosmetic surgeon at Cocoona begins the surgery by making incisions in the bones and cartilages supporting the nose. These incisions are made in the nose instead of on it to avoid scarring. Depending on the exact requirement our expert surgeons will then carefully remove the amount of bone and cartilage needed to achieve the desired results. The surgeon may also add some harvested tissue from your own body (or synthetic filler) to give the desired shape to the nose. After our surgeons have reshaped and rearranged the bone and cartilage inside the nose they will then re-drape the tissue and skin over the nasal structure and a splint will be usually added for some time after the procedure to support the new shape and structure of the nose till it recovers naturally. What is recovery like after a Rhinoplasty at Cocoona? The expert surgeons at Cocoona are trained in using the most efficient and effective surgical methods to perform the Nose Reshaping surgery. Every precaution is taken to ensure that the risks of complications resulting from the surgical procedure are avoided at all cost. Your recovery depends mainly on the type of incisions used as well as your body’s rate of healing naturally. The surgeon will remove the supporting splint usually within the week. Your face may feel puffed-up and bruising might be seen around the eyes and the nose for several days after the surgery, which is normal in the circumstances. A cold compress can help to reduce the swelling on the face as well as alleviate pain. Painkillers may also be prescribed in case the facial pain is severe, which is rare. Your face should return to the normal state within 1-2 weeks. Rhinoplasty is most useful in changing the size, shape as well as the angle of your nose to make it better in proportion to the rest of the face. The cosmetic surgeons at Cocoona also perform Nose Surgery procedures for correcting a birth defect in the nose that causes complications such as breathing problems and chronic congestion. These go away on their own or need rest and ice packs to treat them at home. The cosmetic surgeons at Cocoona are well-trained and take every possible precaution to avoid these complications from arising. 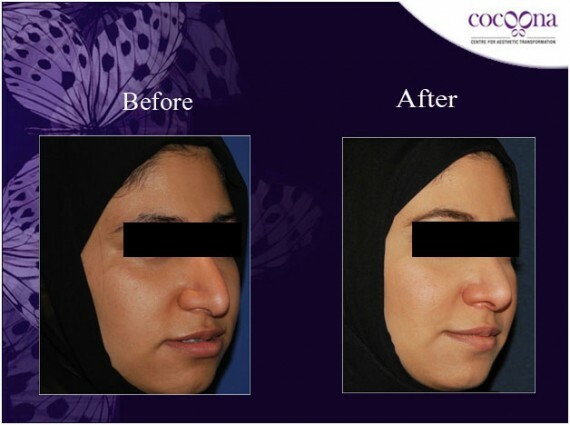 What are the success rates of Rhinoplasty with Cocoona? 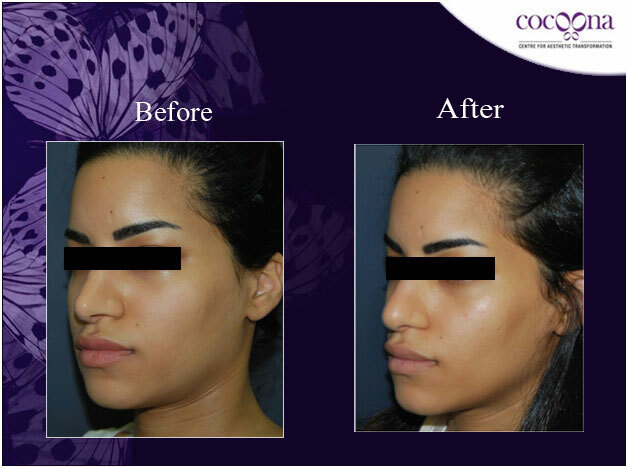 Cocoona offers the best and most effective rhinoplasty procedure using the latest in surgical technology to achieve optimum results for you. The results seen after a rhinoplasty surgery at Cocoona are highly noticeable. Every realistic expectation of the patients is achieved through careful planning and executing the surgery. These results are long-lasting so you need to be fully aware of every aspect of the surgery as well as the desired result as corrective surgery for a rhinoplasty is not only more expensive but it is also difficult and strenuous on the patient.